In the recent years more and more wireless providers have started to provide femtocells to their customers. 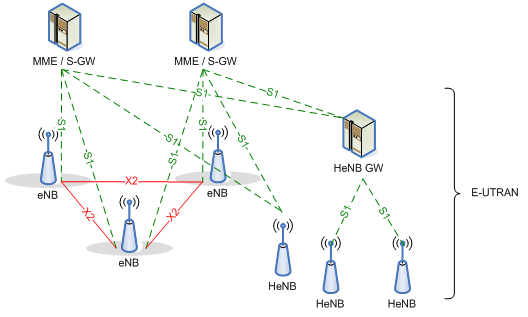 The customer can deploy the femtocell in any location that the coverage of normal towers are weak or absent.Â Consider a product like Samsung’s Ubicell. The user can plug this femtocell in their home internet switch, and use their regular cell phone to connect to the final service provider, e.g. Sprint. As of December 2008, 3GPP documentation for Long Term Evolution networks has started to mention Home eNB as part of the Evolved UTRAN. This move can be a significant advantage for the final users, only if service providers fully recognize the extent of service this final addition can offer. This recognition might require a careful study of 802.11a/b/g Access Points, considering the similarities of the two products. Both these products are the front end of a network to final customers. While these final points are accessible to the customers, the actual network is not controlled by them. Most APs initially were merely wireless transmitters, but they soon started evolving into more sophisticated equipments. The need to provide more functionality for the end user to adjust settings, e.g. channel or user access rules, resulted in simple interfaces to configure the AP. Currently wireless APs are commonly acting as firewalls, switches, DSL modems.Â But the true revolution for the APs happened when vendors such as Linksys started to provide open source firmware for their products. Because of the delay in this revolution, many golden opportunities are gone and we do not see as many diverse applications. Given how larger organization such as universities might consider deploying a number of Home eNBs throughout their campus, there is a high level of interaction that would be only limited to these eNBs. As an example, in a university campus many calls and data interactions would be between students on the same area. Or consider an event like SXSW. While this year AT&T added enough resources to guarantee good coverage, smaller scale events do not motivate service provider to make such adjustments. Instead the organizing institute is well aware of the scale and the available resources and would be able to allocate more eNBs to the event area. One other aspect is access control: if I am paying for a Home eNB, I may not want my neighbor to user it for free unless it is an emergency call. By providing good configuration options to the deploying organization, all sides of such scenario would benefit: the organization would enjoy faster service on their campus, the service provider would not have to worry about resource management and the manufacturer would ensure better sale of its products. There are many challenges in providing such control to the final user. However, I believe the designers of 3GPP LTE have started taking initial steps and now the manufacturers need to move forward. This entry was posted in General, review, wireless and tagged cell, femtocell, wireless. Bookmark the permalink.